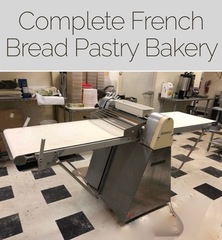 M21902 Famous Cenan French Bread Bakery has closed and will make a complete liquidation of its high end, Top European brands. Mixers, ovens, formers, shapers, dividers, crumbers, chocolate shavers, special assets, small wares, so much more. AUCTION CLOSING DATE: Friday, November 16th at 1:07 pm. Bidding closes on the first item at 1:07 pm, then closes at the rate discussed in these Terms and Conditions of Sale.